Suspended over a moving treadmill at UofL’s Kentucky Spinal Cord Injury Research Center, Jeff Marquis’ feet and legs were led in stepping motions by trainers. Researchers, including Claudia Angeli, who was in charge of the experiment, monitored his every move. An epidural stimulator implanted on his spine allowed Marquis to move his paralyzed legs. After a while, he was able to step with his right leg on his own, while the trainers helped his left leg keep up. The movement was small but the moment was monumental. Most physicians and scientists would have said it was impossible, yet it had just happened. “It’s what everybody had been waiting for — a paralyzed person was walking,” said Angeli, assistant professor in the Kentucky Spinal Cord Injury Research Center (KSCIRC). Those initial steps were the first that Marquis had taken independently in six years. The therapy to get him to that point was the culmination of years of work by the research team, led by Susan Harkema, who has studied the effects of epidural stimulation in spinal cord injury for more than a decade at UofL. The historic moment came and went quickly, however. More motivated than ever, Marquis and the team focused on continuing the training session. There was more work to be done. Nearly 6,000 people who suffer complete spinal cord injuries in the United States each year are told they will not walk again. Many of them are young victims of a car crash, fall, sports injury or other accident that abruptly takes away their mobility, health and independence. Recovery from a chronic complete injury — one that leaves individuals unable to move below the injured portion of the spine for more than a year — was not considered possible before this research. Before his accident, Marquis was an independent outdoorsman working as a chef and in a ski shop in Whitefish, Montana, where he was an avid kayaker, mountain biker, skier and snowboarder. In 2011, he was biking on a mountain trail when he missed a jump and landed on his head. The accident left him quadriplegic. He was unable to move his legs and had limited mobility in his arms and hands. “After my injury, I needed help twice a day. Living in Montana, the same things that had attracted me to the area became a big challenge. Everything revolved around the sports I couldn’t do anymore, and the weather was difficult to deal with in the winter,” Marquis said. From her earliest research as a neuroscientist at UCLA, Harkema was motivated to help people with complete spinal cord injuries achieve recovery. Since she joined UofL in 2005, Harkema has used her understanding of how spinal circuits function to explore new possibilities for healing. Based in KSCIRC’s research lab at Frazier Rehab Institute, Harkema and the research team conducted the first human tests using epidural stimulation. In 2009 Rob Summers, who had been completely para-lyzed since being hit by a car three years before, was the first human to be implanted with an epidural stimulator for spinal cord injury. The stimulator allowed Summers to stand and voluntarily move his legs. The research also included stand training and locomotor training, physically moving his legs in a walking pattern. Three other research participants received stimulator implants and also were able to stand and move voluntarily. Yet none was able to take steps on his own. Shortly after his accident, Marquis had heard about the research at UofL and added his name to the research database. He had spent months in rehab, but recovery was slow. In 2014, he got the call to participate in the research. After receiving the implant in 2015, he completed 278 locomotor training sessions over 18 months before becoming in 2017 the first person with complete paralysis to walk over ground. After taking his first bilateral steps on the treadmill, he gradually was able to support his body weight and walk over ground using poles, steadied by the trainers, to balance himself. Just a few months after Marquis took his first steps, a second participant, Kelly Thomas, also took her first independent steps since a 2014 car crash left her paralyzed. A paraplegic, Thomas has use of her arms to help in her training. 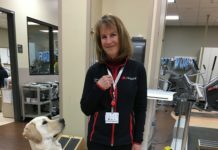 Her journey from implant to walking over ground took three and a half months and 81 training sessions. Thomas said the effort it took to get to the point of walking was tremendous. Claudia Angeli and Katie Pfost assist Kelly Thomas in the KSCIRC lab in Frazier Rehab Institute. Like Marquis, Thomas found that steps came more easily on one side than the other. For the research team, the goal of having someone who was completely paralyzed take steps on their own had been achieved — twice. Harkema and Angeli credit the participants with much of the research’s success. “They are the ones who come in every day to train and put in the effort. It’s their willingness to be here and help us understand more that makes this a successful program,” Angeli said. Despite the remarkable levels of recovery they’ve made, both Marquis and Thomas hope for more. Part of Marquis’ motivation is that he wants to regain his independence. One of the most difficult aspects of life after his accident was the fact that he needed help twice a day for basic tasks of life — getting out of bed, preparing food and cleaning. The training and stimulator have restored much of his independence. His strength and stamina have increased to the point he can cook and bake again at his Louisville condo. And he no longer needs daily — or even weekly — help at home. Marquis still uses the poles for balance when he walks several times a week in the research facility, and he stands on his own at home using a specially designed frame. He now is taking part in cardiovascular research with the stimulator at KSCIRC; he hopes that work will improve his breathing and stamina even more, enabling him to walk longer distances. Thomas is back home, living on her family’s Florida ranch, attending college with the goal of a bachelor’s degree in criminal justice and working on her own to improve her mobility. Having gained confidence walking with only a walker, Thomas is comfortable moving around the ranch and in public places. Thomas’s mother, Therese, said she used to worry about her daughter regularly. “Before, I would call her constantly, wondering if she had fallen and couldn’t get back up, or worried she would choke and we weren’t there to help her,” Therese said. She no longer worries, thanks to Kelly’s increased strength and stamina from the stimulator and training. “She spends a lot of time alone, and we have been able to take a deep breath and not worry every second we aren’t with her,” Therese added. Following their implants, Thomas and Marquis both noticed overall health improvements, faster healing and increased stamina and temperature regulation. In addition to mobility, research at UofL is showing epidural stimulation improves other health issues that typically accompany spinal cord injury, such as cardiovascular, bowel, bladder, sexual, respiratory and immune functions. A major study is underway at UofL to learn more about these effects of epidural stimulation in 36 additional research participants. Harkema and Angeli both say they want to see epidural stimulation improve the lives of more people with spinal cord injury. Making this therapy available to the public will involve more advanced stimulator technology, Food and Drug Administration approval, insurance coverage for the treatment and training for physicians. For this to happen, more successful cases are needed, along with a better understanding of which patients are most likely to benefit. Thomas, who plans to attend law school, says she is happy carrying on with life. There are three components to the research that got the patients to take their first steps. 1. First, the electronics. An electrode array is implanted on a portion of the lower spinal cord that controls movement of the hips, knees, ankles and toes. The array is connected to a control device implanted in the abdomen. The epidural electrical stimulation makes the spinal cord receptive to external stimulation and training. 2. Next comes locomotor training, in which the participant’s body weight is supported in a harness over a treadmill while trainers move the knees and feet to simulate walking. This repetitive stepping motion retrains the spinal cord in the pattern of walking. 3. Finally, the participant must have the active mental intent to move and take steps. As the participants’ ability increases, body weight support is reduced and trainers gradually withdraw assistance. Once stepping on the treadmill is mastered, participants may advance to walking over ground.